The purpose of the Silver project is to develop a small number of easy-to-make components that can be combined into a complete AR-15 lower receiver. Because the design of the AR-15 lower receiver is essentially in the public domain, many folks have, over the years, endeavored to produce their own examples at home, in their own workshops, for their own use (any other use, such as unlicensed sales, would violate Federal law). Materials employed include billet aluminum, plastic, wood, even HDPE cutting board. The increasing availability of low-cost desktop CNC mills and 3D printers has accelerated this drive. Finally, of course, the so-called “80% receiver” movement has allowed many thousands of hobbyists (and, quite likely, more than a few felons) to produce their own aluminum AR-15 receivers with little more than a power drill or a router. The 80% process leaves me kind of cold (essentially, you drill or route some material from a nearly complete AR-15 lower forging), but I’m still interested in making AR-15 receivers and even complete rifles of my own design. I don’t have a CNC mill, nor am I skilled machinist. But I have a great deal of experience designing parts made from custom aluminum extrusions. So I thought about how I could employ custom aluminum extrusions to produce an AR-15 receiver design that required a bare minimum of machining. The design I arrived at is called Silver (the project names I use are assigned randomly by a spreadsheet I have set up). Because the two magazine well parts use the same extrusion, there are three extrusion profiles. The object is to make the machining as easy as possible, so even CNC n00bs can do it on cheap mini-mills or maybe even drill presses. The version I have produced today, Silver III, can doubtless be optimized in that direction; but because I am a long way from producing physical aluminum specimens, I thought it wouldn’t hurt to expose where I am now for comment and suggestions. 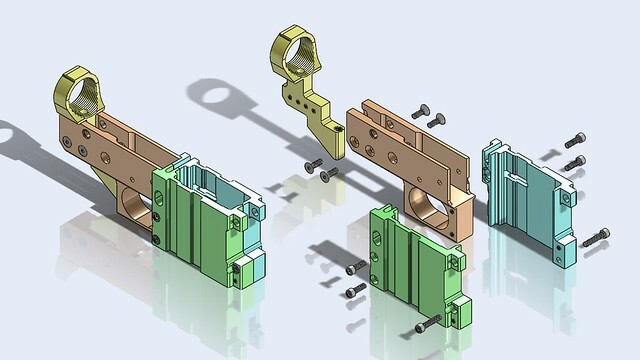 Once the designs are finalized (and assuming there is anything more than the most tenuous interest in what I am doing), I intend to produce the extruded parts for sale and publish the drawings and specifications along an open source model. There are legal issues. After consultation with my (firearms) attorney, I’ll write to the ATF Firearms and Ammunition Technology Division to get them to declare exactly when does something like this become a firearm. I’m not interested in knowing how many holes need to be drilled before we have crossed an arbitrary threshold; I would prefer to understand whether they think any one of the four completed parts is a firearm (I suspect they will declare a fully machined FCG receptacle a regulated firearm), or some combination of parts. Obviously all four parts screwed together is a complete (if stripped) AR-15 receiver, but when is that line crossed? This is of interest to me because I may also want to produce machined parts for sale, though I don’t really want to have to get an 07 FFL. Maybe if ATF says the FCG receptacle is a firearm, I could offer the other three parts fully machined plus an unmachined FCG receptacle. Who knows? Just thinking out loud here. Obviously this is much more complicated than banging out a receiver from an 80% forging, so I am not thinking about the guy who just needs a quick unpapered receiver (or twenty of them) for whatever reason (I don’t wanna know). I am more interested in the firearms hobbyist like me, the guy who likes to noodle around in the shop, who doesn’t mind machining and customizing stuff, but would also appreciate a shortcut. A lot of guys who have gotten this far and have looked at the illustration have already said to themselves, “Hmm, if those magazine well pieces were bigger, they could accept 7.62x51mm magazines.” Yep. The Silver design could be made very flexible that way. It could be made to accept any of the several 7.62x51mm and .308 Win magazine standards that are out there. Maybe even AK or 9mm mags. A different grip and stock support could be used to make an AR-10. It goes on and on. And it doesn’t have to be hard, or expensive: a custom extrusion die costs $750. These are early days. By June of 2016 I will be living in Reno, NV, and aside from some preliminary 3D printed SLAs, I won’t be doing any production before then. Living in Nevada makes a lot of this much easier compared to living in California. But in the open source spirit that is driving this development, I thought I would take some time to introduce this now, to get some input and ideas. Shortly I will be making Parasolid files available on my website for free download. I think it’s a neat idea, but you guys might think it stinks.